Next Century Publishing Releases "Bakers And Bankers: Pun Jokes For All!" A collection of witty and humorous puns that challenge the reader to whip-up crafty humor of their own. The humor in this book is certain to be a hit at gatherings and parties everywhere! Creating a written collection centered around puns? Now that’s a novel idea! Author Roger Davidson deserves a lot of credit for these bun puns that are completely gluten-free. 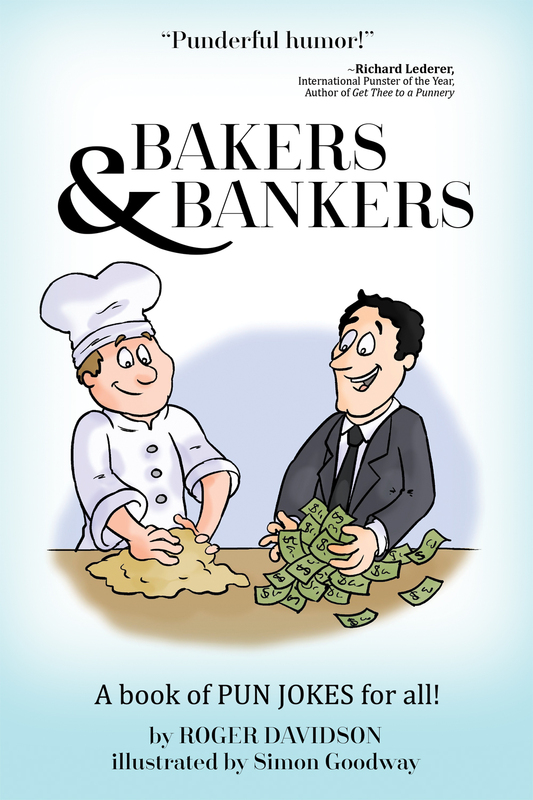 Fresh off the press, "Bakers And Bankers: Pun Jokes For All!" rises to the occasion. These witty and humorous puns will challenge the reader to whip-up crafty humor of their own. Tired of crumby books? This is the only one you knead. Roger Davidson is a musician, minister, poet, and author. Born in Paris, France, Davidson’s journey allowed him to learn four languages: English, French, German and Portuguese. Combining his knowledge of language and sense of humor, Davidson began writing puns, then decided to put them in a book. Feeling a little overdrawn? "Bakers And Bankers" is packed with perfect homonyms having the right consistency to not tax your mind. By showing how different words with identical pronunciation can completely change a meaning through spelling, Davidson offers a double entendre of his own. His book is for anyone seeking comedic relief, but also serves as a teaching tool for learning the intrinsic humor of language—not to mention the hysterical cartoons by Simon Goodway. These puns are suitable for both children and adults, so you don’t have to laugh a-loan. Next Century Publishing is a world leader in book publishing, book marketing, and author support, and a cutting-edge publisher that refuses to accept the status quo. By utilizing the latest in social media and technology, we are increasing readership, book sales, and bottom-line profits for authors. Launching several web-based campaigns, such as GoRead.com, we aim to disrupt and reinvent the mammoth publishing world, while bringing greater value to our authors. The game has changed, and today’s authors have more choices than ever. We are destined to change the way people write, read & experience books!